I had a packed of Quinoa (pronounced keen-wa) sitting in the fridge for months after my cousin bought it when she was visiting, and I decided that it was about time that I used it. I was finally inspired by this post from Amanda (Me vs. the bulge) as even since going gluten free I have missed my porridge. 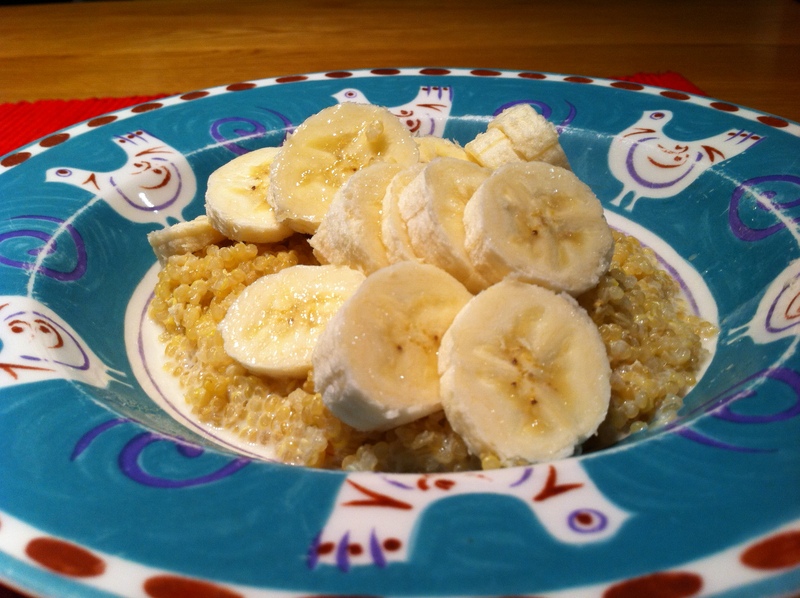 The recipe for Quinoa porridge is really tasty, health and easy (though as Amanda notes be very careful that you don’t boil over the Quinoa and milk as I also managed to do this!). I have been reading up a lot on a2 milk recently and you can read more about it here. However basically a2 is the form of beta-casein which was originally produced by cows many years ago. Over time through natural genetic mutation the a1 form of beta-casein appeared in dairy cattle and spread becoming the common form. Some dairy cows still only produce the a2 type of beta casein and these can be identified and milked to produce a2 milk. a2 milk has been found to be great for those who are lactose intolerant, better for those with allergies (incl. skin rashes, hayfever, cough) plus many more benefits which you can read about here. I therefore decided to give a2 milk a try and used it for this recipe (and did not notice a taste difference), however since I have only used it once to date I cannot report on any benefits yet. Have you tried a2 milk or Quinoa? This looks great! Can’t wait to try it! I haven’t ever used this grain before, but bought it this week and looking for great recipes to try with it. I think I will try this for breakfast in the morning. Let me know what you think! I will also be posting a recipe later in the week using it as a substitute for couscous for dinner. I have been enjoying your blog. I have only been gluten free for a short time and your blog is helping. Thanks. I had some Quinoa in the cupboard for a wee while and haven’t had the courage to use it yet. I have heard that it can used as a substitute for porridge and oh, how I miss porridge. Must be something to do with my Scottish ancestry. I hadn’t seen a photo of porridge made with Quinoa until this past. Thanks for this. It has given me the courage to try it. Glad I could help! Let me know how your porridge goes!